In response to Muhry’s work, published and popularized during the early 1850s, another German medical cartographer and geographer-epidemiologist, August Hirsch (1817-1894), published his Handbuch der historisch-geographischen pathologie (Manual of Historico-geographical Pathology, 2 vols, 1859-1864). A little more than ten years into his career in medicine, Hirsch had the benefits of learning from the writings produced by both the London and German experts in the topographic and climatic fields of medicine. According to a review of the various medical topography and climatology publications in possession of the Surgeon General’s Office Library during the first half of the nineteenth century, the most active publishers of this part of Europe were located in Ogdenburg, Copenhagan, Hamburg, Danzig and Konigsberg, with more inland settings such as St. Petersburg, Berlin, and Frankfort providing important medical topography and climatology reviews of land located much further inland. By the 1860s, publishers throughout the German Empire had produced as many, if not more medical writings on this topic that an equally sized portion of land under review by Western European physicians. Adolph Muhry resided in Hanover; August Hirsch spent his first professional years in Danzig and later performed much of his medical geography work in Berlin and employed in a small town in Thuringia. His most important publisher had businesses in Heidelberg and Leipzig. Much of his fame and success can be attributed to the professional life he spent right at the boundary of both the Western and Eastern European writers in medicine and medical geography. This provided Hirsch with the opportunities needed to produce a fairly complete synopsis of medical geography as it was witnessed and experienced by professional residing upon the largest continent in the world. He was published not only by the local medical press, but also by such places as Vienna and Paris. Due to the location of his upbringing in Hanover, close to the western edge of the German Empire, Hirsch was well read in the politics behind the fights between the natural philosophers and early socialist interpreters of disease and society who were led mostly by Adolph Muhry during the 1850s, and the non-socialists from Western Europe who were more in interested in the scientific interpretations of disease and led Alexander Johnston and his followers of Great Britain. For this reason, Hirsch’s most important contribution to this view of disease was his emphasis on the pathology of disease and the various ways a disease could be mapped based on its physiological and anatomic expression. Hirsch focused on both the anthropological and scientific points of view for an illness whenever studying the disease pathology. For his scientific point of view he emphasized natural events and their influences upon the physiology and different parts of the body. He interpreted the social impacts of disease only so far as their impacts in a purely natural, scientific, and very much pre-Darwinian sense. in a correlative versus totally non-correlative fashion (relationships or the lack thereof between two or more disease patterns occurring in association with each other spatially). The most important product of Hirsch’s work is a single set of books designed to pull together most of the previous observations and writings published by medical geographers. This began as early as 1859 when he published his 2-volume set Handbuch der historisch-geographischen pathologie (Manual of Historico-geographical Pathology), but became more important globally once his work was extended, republished and then translated into English in the form of a 3-volume summary of the work between 1883 and 1886. With this publication, the foundation for a complete study of medicine and disease as a geographic topic was finally defined. Important to note are the other historical events occurring at this time in medicine, for it was the impact of these other events that diverted a significant amount of attention from Hirsch’s findings and writings. The evolution of the animalcule theory into the “germ” theory for disease was now well on its way to becoming broadly supported. This theory provided evidence for the existence of a mechanism other than those linked to topography and climatology for the evolution and onset of new diseases and disease patterns. The impact this “germ theory” had on the medical geography field was substantial, for it allowed physicians to begin to ignore or set aside much of their earlier trainings in the physical environment causes for disease. In exchange for this change in philosophy physicians began to focus on just the microorganism responsible for many of the maladies and how to deal with its biological activities. This rebirth of claims made popular by earlier “animalculists” did not fair so well in some of the medical profession and public settings, for which reason it took another decade or so (1883 to 1903+) for this philosophy to completely take hold, and for the older practitioners who did not want to fully adhere to this philosophy to die off. For this reason we find increasing amounts of evidence in favor of the development of medicines meant to specifically target the invisible causes throughout this period, accompanied by a decrease in the popularity of the need to focus on the naturalistic perspective of disease ecology and behaviors. Those who retained this nineteenth century philosophy were able to do so by strengthening their arguments about the various zoonotic diseases that couldn’t be ignored. This enabled germs, animalcules, and microbes to remain focal points for certain types of epidemiologists wanting to examine and research the ecology of disease, studies and practices retained extensively by physicians east and west of the German Empire. 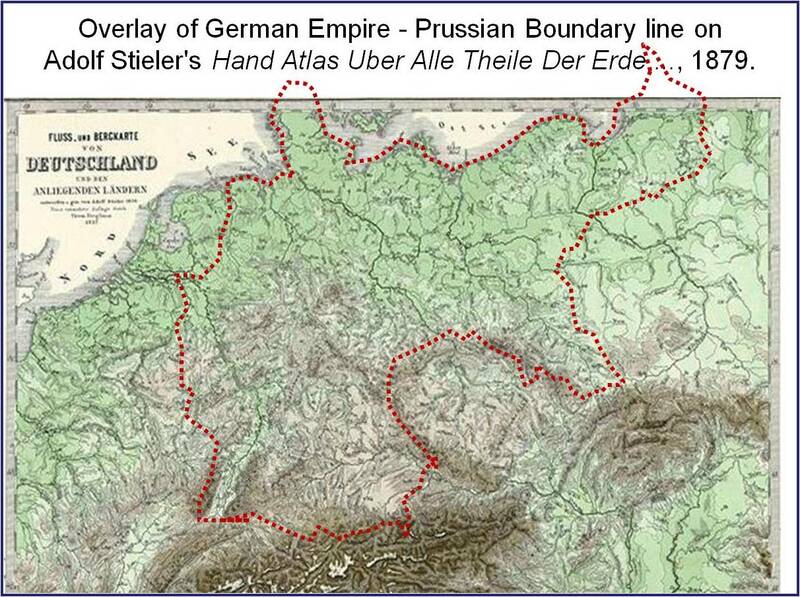 The following map details the complexity of the region noted as the German Empire in the map above. A number of large political boundaries often changed in this part of Europe during the second half of the nineteenth century. Accompanying these changes in political boundaries were the changes in science and medicine that ensued due to the professional guidance and leadership changes that followed. At the time of Hirsch’s first publication of his interpretation of disease geography, limited attention was paid to his accomplishment. Any discrepancies his writings had with the claims made by previously published geographers such as Adolph Muhry, Ferdinand Becker, Heinrich Schweich, Casper Friedrich Fuchs, and the late 18th century medical cartographer Leonhard Ludwig Finke, seemed to prevent Hirsch’s work from have a major impact outside the political realms of the German Empire and its related Prussian influences. 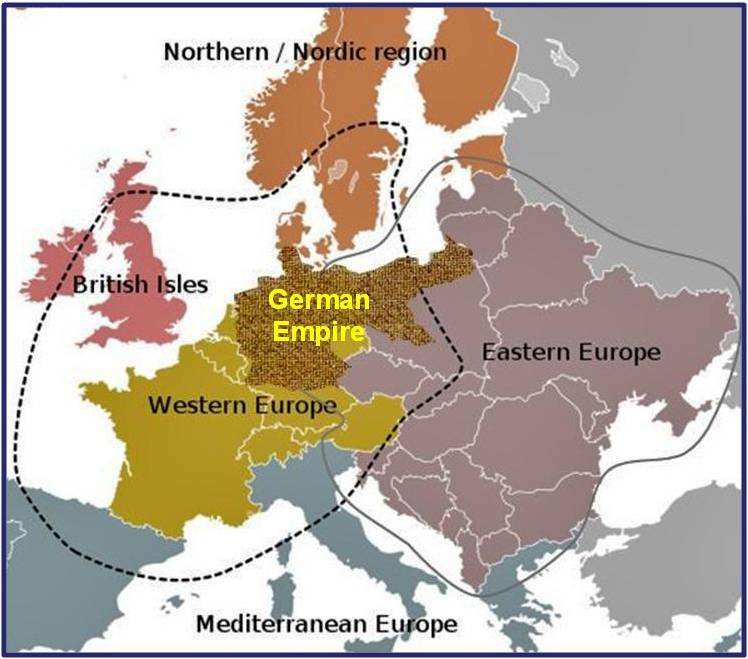 In a fairly broad political sense, we can break the German Empire down into other types of regions, as the following map for 1815 to 1866 suggests. During this period, medical topography and medical climatology were in their early stages of development. 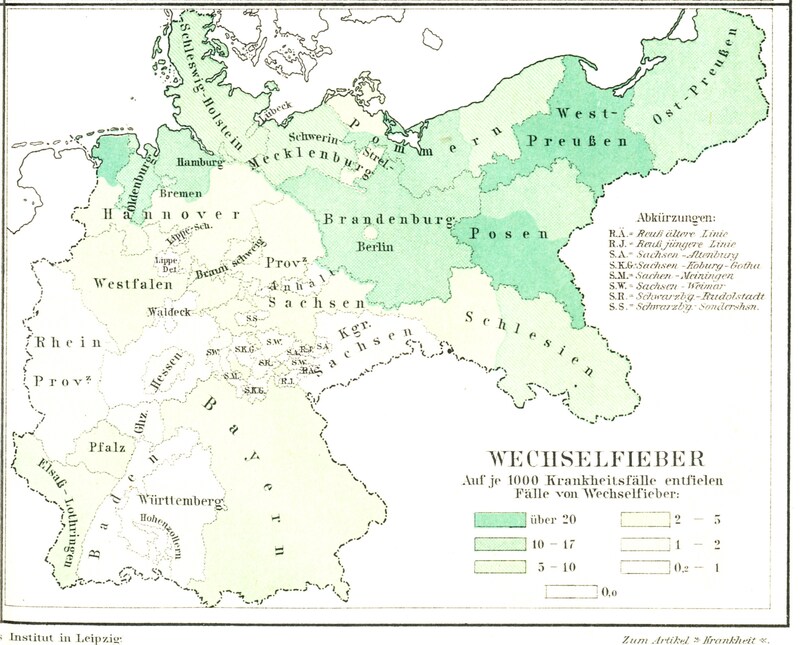 the physicians who published their interpretations of disease and the environment are those who would also provide the knowledge needed for the German Empire to reach the level of success that it did with disease or pathology medical geography. There was a significant impact which both the Far Eastern countries like Russia and the Far Western European countries and cultures, beginning with the Netherlands, had on Hirsch’s work and the long-term outcomes of his writings. The following four maps were produced about the same time as the publication of August Hirsch’s multi-volume reference entitled Handbook of Geographical and Historical Pathology (London: New Sydenham Society, 1883-1886, 3 vols.) . There are significant spatial differences in the distributions of the four disease patterns on these maps. One of the most easily noticeable differences is between Lungenwindsucht (Tuberculosis or Consumption) and Wechselfieber (Malaria). Tuberculosis cases show a tendency to prevail more frequently at the southern end of this region, and Malaria at the more northern end. 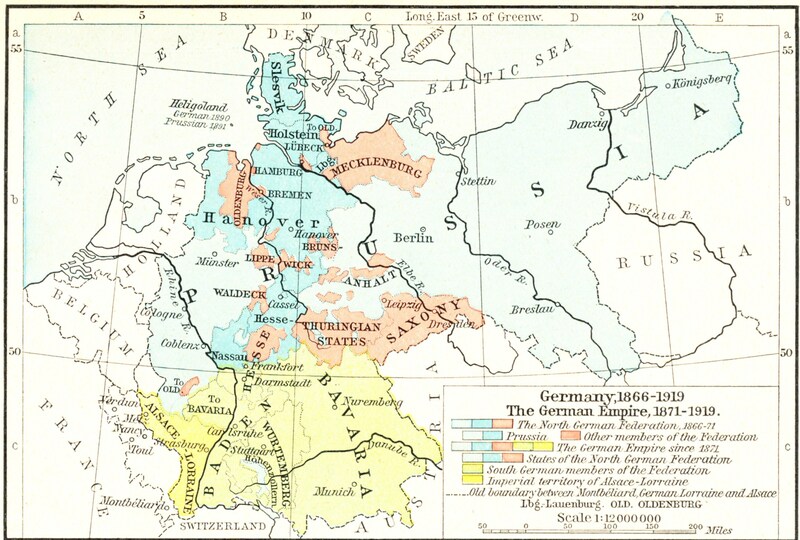 Likewise, the form of “typhus” displayed on the upper right quadrant of this four-map series shows a tendency to be more northern-like in nature, but retains its ability to spread southward through middle Deutschland, occupying specific parts of the central region more than others for reasons not defined by this map. The fourth disease map in this series depicts the spatial distribution of diphtheria, and demonstrates the existence of a fairly well-defined center or nidus for typhus (or typhoid?) in Mecklenberg, a region located on the southern Baltic Sea shore. Equally important to note is the near absence of typhus/typhoid within the neighboring area to the south, Brandenberg, at the center of which is one of the most heavily populated cities in Germany–Berlin. Each of the above distinct geographic patterns can be described based on demographic, disease ecology and topographic features. The most important human geographic features to pay attention to for three of these diseases are economic and/or transportation spatial relationships, followed by spatial demography. Two diseases are fairly climate and/or topography dependent. One disease is primarily ecologically and topographically dependent once human-related influences on its diffusion pattern are taken into consideration. Yet another demonstrates the significance of Muhry’s emphasis on understanding the influences of poverty on disease behavior, a feature minimized by Hirsch’s predominantly scientific and anthropologic approach to disease mapping. 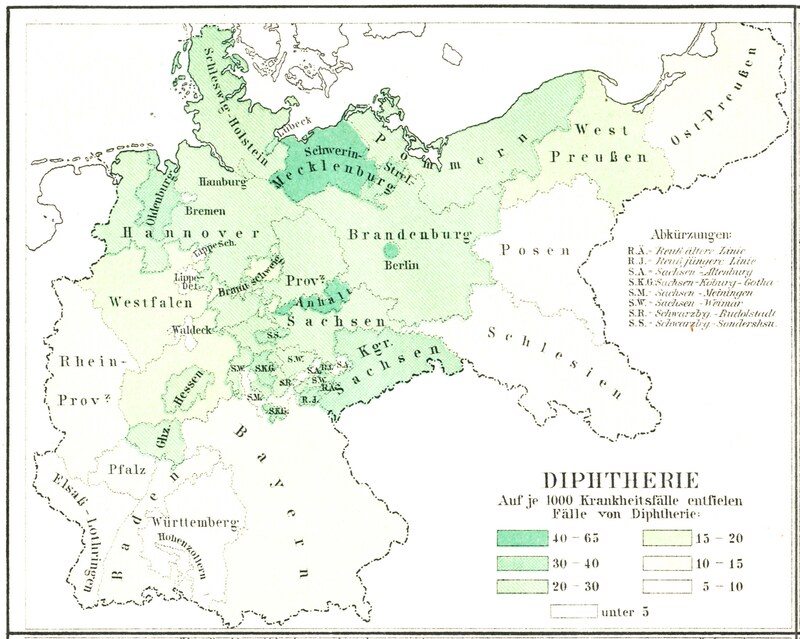 The two niduses or centers of diphtheria cases are located somewhere in the political areas named Mecklenberg and Anhalt. Likewise the city of Berlin experienced a large number of cases on a per person basis, followed by the region of Oldenburg and Kingdom of Saxon (“Sachsen”). 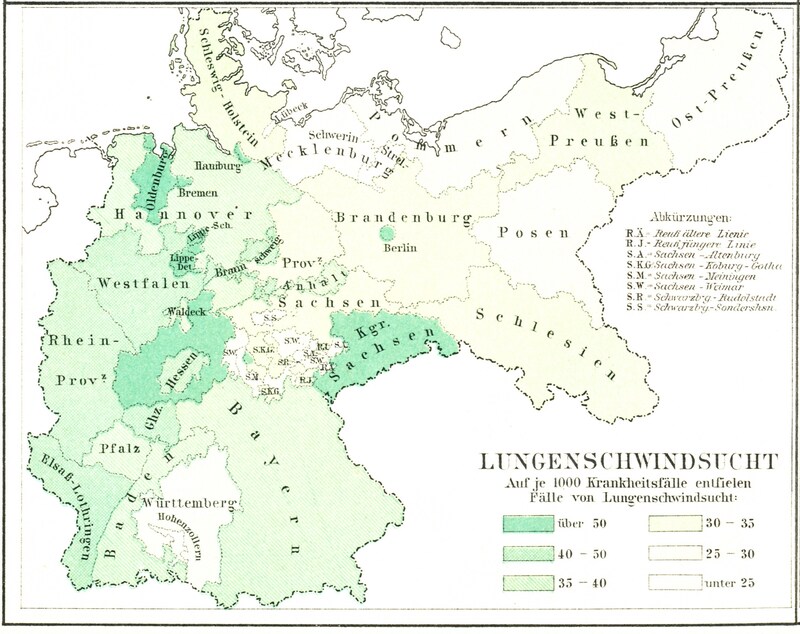 The regions surrounding these areas with niduses demonstrated fewer epidemics, which on a per person basis diminish pretty much as one heads southward, eastward, and westward through and away from the German Empire. The geographic characteristics of diphtheria relate to their mechanism of spread. Diphtheria is a highly infectious disease capable of being spread from person-to-person, by some form of direct contact or in the form of aerosolized particulates or droplets spread by cough and other aerosolization methods. The primary characteristics of diphtheria are the development of a sore throat, followed by the formation of a false lining to the esophagus known as a pseudomembrane. This pseudomembrane forms due to the colonization of bacteria within oral mucosal tissues located at the back of the oral cavity and in the upper esophagus. This pseudomembrane reduces the internal diameter or size of the airway, and as this swelling increases, it can ultimately cause death due to the various systemic effects of the infection, such as the sloughing off of tissue, in combination with suffocation. Other symptoms accompanying the psudomembrane include a mild fever, a significant amount of swelling of the neck (called bull neck), and occasional episodes of peripheral neuropathy (currently, for approximately 10% of cases) and a heart problem known as myocarditis (currently, approximately 20%). Diphtheria is at its worst when the Corynebacterium diphtheriae infecting a person has been genetically modified or activated by a specific form of virus known as a bacteriophage. Infection by this organism causes Corynebacterium to release some highly toxic proteins referred to as diphtheria toxins. These toxins can cause severe cardiac complications and result in paralysis of important muscles, including those associated with head and neck and the various respiratory processes. This latter complication in association with the development of a pseudomembrane makes this disease fatal when patients do not receive appropriate treatment. The primary way to save a life with this disease is to perform a tracheotomy in combination with monitoring the remaining problems that exist symptomatically as best you can. Understanding this aspect of diphtheria helps to identify specific physical and sociological causes for the increased fatality occurring in one region versus the next. Not only are incidence rates a major factor in determining the amount of deaths diphtheria can result in, but also the incidence and prevalence of specific diphtheria forms demonstrating high sensitivity and reactivity resulting from bacteriophage exposure. These latter features also have their sociological causes to consider, such as the lack of adequate health care and preventive practices in specific community settings, and the increased likelihood of becoming infected by an activitated form of Corynebacterium and/or a strain that is especially productive with its diphtheriatoxin release. To fully understand the combined biological and social reasons for these areal differences in death rates, more reviews have to be done of the highest epidemic areas to determine the microecological features responsible for the higher incidence in the above noted coastal areas. In contemporary terms, typhus is a disease caused by exposure to any of several species of the Rickettsia parasite. Traditional historically important Typhus cases are the result of exposure to Rickettsia typhi, a microorganism that is vectored through fleas hosted by rodents. This is one of the primary cases for the historically important plague or pestilential epidemics noted in European history, but in well-established urban setting, is actually a disease of a potentially endemic nature. In a historical sense, we therefore consider the urbanization of a region, and its accompanying increase in rodent populations, as one of the major causes for the onset and return of typhus. When epidemic typhus develops, it is often the case that another form of Rickettsia is involved, Rickettsia prowazekii in association with human lice related problems. Once again, living conditions play an important role in how and when such epidemics development. However, it is more often human living practices that help to define the ecology and distribution of this zoonotic disease. The epidemicity versus endemicity aspect of this form of typhus is related primarily to the changing environmental settings in human-occupied settings. It is assumed that living conditions periodically get “worse” and then better due to specific corrections made by public health professionals and political leaders, with the sign that things are getting “worse” being the onslaught of this form of typhus. The chief cause for these three forms of typhus is the combination of filthy bodies, residing in filthy living conditions, being harbored or held within tightly packed quarters. During the nineteenth century, the most common forms of typhus are the ship fevers and jail fevers often noted in the historical documents on morbidity-mortality rates. These cases also prevailed in tightly-packed living environments, primarily those associated with urban settings where social inequality-related living conditions prevailed. In these cases, the endemic causes for typhus are the rats and Rickettsia typhi, but the more serious cases associated with typhus epidemics prevail due to human-lice related causes. The other disease commonly confused with the various forms of Typhus was typhoid fever. Typhoid fever or typhoid is caused by Salmonella typhi, referred to as Salmonella enterica enterica typhi by microbiologists focused on its genetic make-up. This disease is spread primarily as a consequence of poor sanitation and food management practices, and is much less environmentally and ecologically-bound to vector-host-human relations than typhus. Like typhus, typhoid can get progressively worse over a several week period. 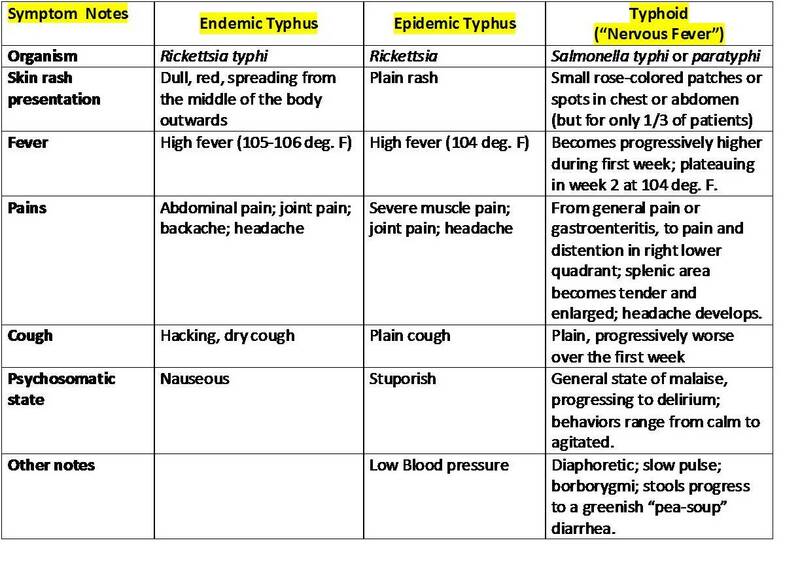 The major differences between typhus and typhoid symptomatology are apparent during the first and last stages of these diseases. The dermatological condition helps to differentiate the two different forms of typhus from each other as well as from the typhoid condition. The worsening of the pains and their tendency to be more focused with time helps to differentiate typhoid from endemic and epidemic typhus. Diarrheal states, abdominal griping and borborygmal patterns, and the progressive end-stage changes in both hollow and solid organs such as intestinal inflammation, bleeding, and abscessing, the development of septicemia and formation of abscesses throughout the body, accompanied by encephalitis (CNS), endocarditis (heart), peritonitis (abdominal) and osteitis (bone) related tenderness and pains makes typhoid a more symptomatic and fatal disease than the two forms of typhus. Again, if we consider these symptoms in retrospect, it is easy to understand how and why the epidemic typhus could be associated with typhoid fever. If a single cause were to exist for disease types, the typhoid fever could be interpreted as a more aggressive path taken by the same illness state typhus, or the result of a disease taking a much longer path resulting in severe consequences. Therefore, without any specifics regarding the microbiological causes for these disorders, a common sense approach medical topographers and climatologists might have taken in the interpretation of these disorders is that endemic typhus exists, and is made worse by specific local events thereby developing into its epidemic form, followed by the evolution of the disorder into a highly progressive and fatal form of plague-like proportions. This rationale also follows the earlier teachings of Noah Webster (ca. 1800-1820), who like others felt that the development of new epidemics was an important precursor to predicting the onset of a future pandemic disaster brought on by pestilence and/or contagion. This inability to distinguish typhus from typhoid would not be fully resolved for nearly 3 decades. It would require complete professional acceptance of the discovery of the germ theory around 1876 to enable pathologists later define an exact cause for each of these maladies. By the time Hirsch’s books were published, and the above maps were drawn (not by Hirsch), the differences between these similar disease types were only slightly better understood. For this reason, the exact definition of the unterleibstyphus (translated: typhus abdominalis) depicted on the map is more likely referring to typhus in a much more traditional sense, not typhoid fever. The traditional typhus, sometimes associated with the plague, has a different cause and presentation than true typhoid fever. As the name typhus abdominalis suggests, unterleibstyphus causes numerous abdominal symptoms including griping and cramps, commonly but not necessarily accompanied by a febrile state. The main symptoms for typhus are abdominal in nature; those for typhoid fever are related to the febrile state. Compared to diphtheria, the disease reviewed above, typhus is distinctly different in its distribution within the coastal settings and communities. The exact reason for this difference is what a geographical interpretation of typhus versus diphtheria should hopefully reveal. Possible reasons for this difference between the locations of the focus for each disease could relate to differences in demographics and population density, culturally-defined lifestyle practices, or host-vector ecology geographic features. A higher percentage of poverty-stricken communities on certain areas could help to define the local typhus problem as one of a true typhus form, either murine (uncleanliness, mouse and fleas) or human (people, poverty and lice) in nature. The development of large urban setting due to commerce and industry could also explain such incidences. It is also possible for commercial settings to enable the Oriental version of this problem to intervene at times in local health and economy, and it is more than likely possible for the urban and economic growth to lead to Salmonella typhi infestations to develop. Tuberculosis or consumption is very much dependent upon surface features. Changes in the three-dimensional land surface impacts the ability of a disease to exist naturally within its surrounding environment, in either an active or dormant stage, and be passed on to new victims either directly in the form of suspended moist particulates (sputum, tissue microspheres, etc.) or indirectly in the form of infected materials found in the air. The most noticeable areas of high risk to note are Oldenburg, the Kingdom of Saxon, the are encircling about Hessen, and two small areas between Hessen and Oldenburg (the Lippewyck area). The following demonstrates this case distribution relative to local topographic surface features. Whereas typically we expect significant reductions in tuberculosis cases and the ability of these cases to remain active with higher elevations, the incidence rates alone do not demonstrate this particular climatology related medical geography feature. In this case, landform changes were not significant enough to cause drastic reductions in case frequencies, even in the substantially elevated Saxon area. The reason for increase incidence in the Saxon area is somewhat perplexing in microbiological terms. The increased amounts of tuberculosis at a major transportation region in and around Oldenburg makes sense, and the proximity of Oldenburg to the edge of a major water body further supports a climate theory-based method for defining the increased tuberculosis rates in this geographic setting. Supporting the hydrologically related reasoning is the fact that a major water-based transportation route continues through the Oldenburg region, and may be in part responsible for the diffusion of cases inland to several much smaller political regions. This may also be used to explain the reason for a greater density of cases around the mid-elevated region just east of Rhine Province. The area surrounding Hessen is infected more than its interior setting of Hessen. Reasons for this spatial difference are for now also uncertain. It is possible that such a border between high and low incidence rates regions exists for the very same sociological reasoning promoted by Muhry’s, and diminished and/or changed due to Hirsch’s work. In Germany, Malaria is known as Sumpffieber and Wechselfieber. Sumpf refers to Swamp or Marsh. Wechsel (“change”) refers to the alternating or changing [intermittent] pattern the fever experience goes through for someone with malaria. In a topographic sense, we expect regions rich in Wechselfieber to bear a significant amount of lowlands, water bodies, swamps, and wetlands. Since the vectors normally associated with bearing this disease are typically mosquitoes and the origins of the disease typically tropical in origin, we expect average local temperatures to play an important role in the diffusion process for this disease. Based on latitude features alone it is most likely the case that latitude and related isotherms had little to do with how malaria entered Germany during the late 1800s. The placement of Germany makes it difficult for the disease itself to become ecologically stable within the local environment for the overwinter periods, Although it is possible for some vector species to retain the organism through the winter, enabling the organism and its disease to re-emerge the following spring, the likelihood that this malaria could persist long enough during the coldest weeks of a re-emergence in early summer made it more likely that any subsequent cases to emerge would more than likely have to be the results of new sources or hosts. Maritime transportation was the primary way malaria was introduced time and time again to Germany during most of the nineteenth century. The primary routes to German ports were by way of the Baltic Sea, making contact with Germany shores principally at the northern end of this country. 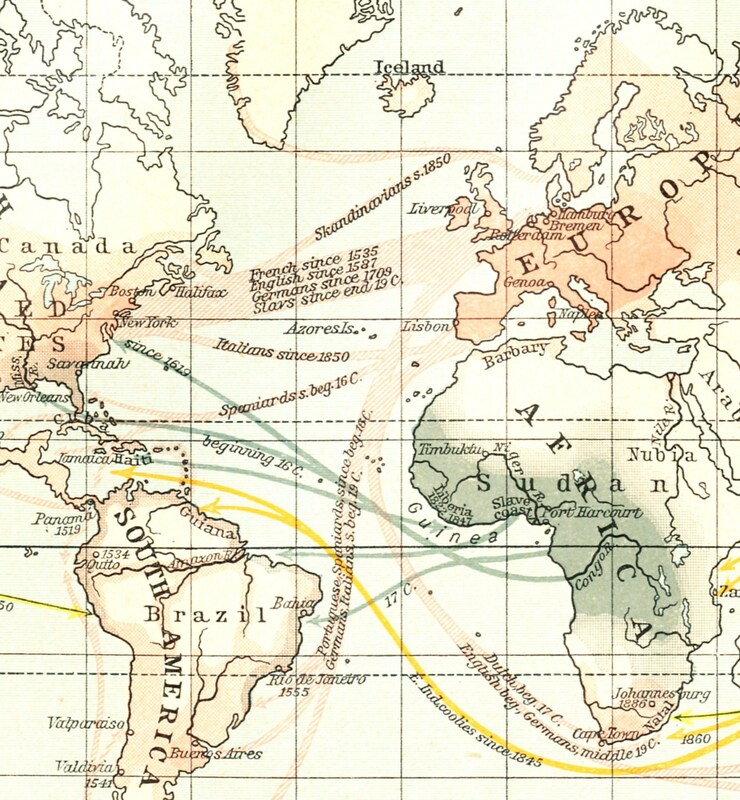 Migration and Transportation Routes extracted from map presented in William R. Shepherd’s Historical Atlas, p. 177. The second reason the northern end of Germany bore the most cases of malaria relates to demographic and economic history. Malaria most likely made its way into Germany directly via overseas travels in which the merchant vessels bore a few or more passengers already carrying malaria and/or the mosquito vectors for malaria. The purposes of these cruises were two-fold–to bring in the next batch of passengers and to deliver goods from other parts of the world. Ships loaded with tropically-derived commercial products would be the most likely, most effective carriers of malaria into the region. Although it is possible that Malaria could have made its way indirectly from Africa by way of stopovers in the Mediterranean, these indirect routes of transfer have a significantly reduced likelihood of succeeding the diffusion process. More direct routes from Malaria regions are more likely to succeed in turning the ports in the west edge of Hanover, Oldenburg, West Prussia and perhaps Pommern into major epidemic regions. The second requirement for malaria epidemic regions is the low elevation marshy regions capable of harboring substantial amounts of mosquitoes. It is expected that a review of the topographic map around the most infected regions would demonstrate a fairly substantial amount of land surface with low elevations.